There's so much more going on in the studio than music making. You don't just come to a class and then leave. 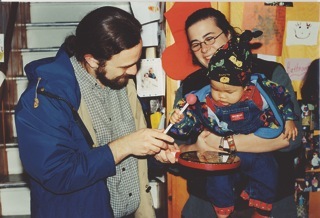 Snack and chat and instrument exploration make it a very special time. Parenting concerns are supported with articles, conversation and families sharing.You will be equipped with simple activities to take home and enjoy together over and over. 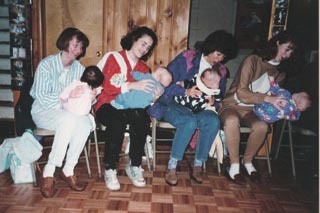 Newcomers are welcomed with open arms, playgroups are formed as well as life long friendships. We are one big extended family, sharing our joy and sometimes our sorrow. Many families return year after year with new siblings. Personal space is always respected for those who prefer not to socialize. It's unlike any music program in Washtenaw County. I hope you will come visit. Come and see what it's all about and help me celebrate 24 glorious years of Music For Little Folks. Programs are researched based and presented in the richness of Traditional Folk Music. 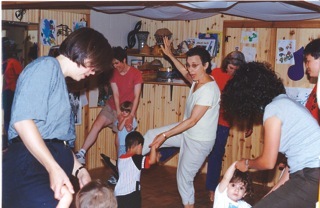 In a fun and informal structure we bounce, chant, do finger plays, sing, rock and row, folk dance, play percussive instruments, listen, dance with ribbons and scarves, sing lullabies, share hugs and more. Together we explore sounds, words, pitch, tempo, melody, tone, meter, rhythm, dynamics, beat, continuous flow, stories movement and dance, After the mixed age program, we have a snack, then independent process-only art and instrument exploration and time for families to gather and chat. Sessions begin in September, January and March. 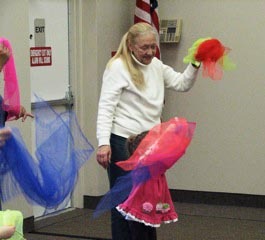 The Sing With Me MIXED AGE program, Birth-5, Weds at 10:15 am. 10-14 week sessions-includes 4 CDs. Siblings under 8 months free-discount @8 months. INSTRUMENT EXPLORATION. NO EXTRA CHARGE! Did you know that an infant's brain will double in size in their first year and that sensory experiences and movement impact brain development? NURTURING BABY & YOU: Babies to Pre-Walkers. A unique program that focuses on play, movement & touch, based on research of the body-brain connection. Sensory experiences and physical movement are two forces behind brain growth. Enhance healthy development & strengthen your bond with baby while having too much fun. Join Gari in a warm, gentle, nurturing environment, with time to chat, share resources & support, learn activities for daily routines that impact the growth of your baby's total development. Music can be your best friend. Learn finger plays, melodies, support tummy time, enjoy nursery rhymes, chants & massage. 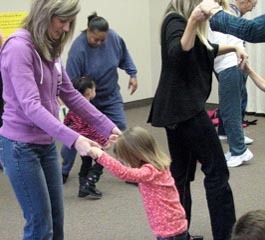 Together we will waltz, folk dance, take sheet rides, explore instruments, sing lullabies & more. Share hugs & laughter & learn techniques to turn cranky to calm. Tuesdays, 11:30 a.m. - 12:30 p.m. Free to members. Only $10 for a 7 week session to Non-Members. Contact Gari for more information. In the comfort of your home or other setting, Gari provides an informal & slow paced atmosphere. Learn songs for everyday routines, movement activities that nourish baby's brain & all developmental domains & then take the music home. Together we will sing, bounce, chant, enjoy nursery rhymes, massage, support tummy time, take sheet rides, waltz, play with instruments, rock in hammocks, sing lullabies, and more. Gari brings relevant articles to share & also provides time for parenting support and the exchange of concerns and ideas. Nurture baby and yourself while enhancing your bond. No older siblings please. Starts anytime as schedule permits. See schedule page for Fees. Please call 734-741-1510 #3 or email Garistein@aol.com to leave a comment, for more information about the program, or to reserve a space for the next available session. Please leave your name, phone, month & year of child's birth and a good time to call you back. Remember, when all else fails, try Singing and Dancing. 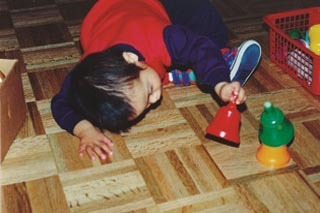 "Gari has such a wonderful connection to music and movement. She brings a real understanding of children and their development. She guides children and let's them lead and explore. Children really feel free and unpressured. In this type of environment they thrive. Wonderful." "Thank you Gari, for such an enriching musical experience. What a beautiful class you lead. As I've said before, what you do, making it look so effortless, has the foundation of loving, thoughtful learning; it's what all great teachers do. We're all lucky to have you!" "You and your music class remain in the foundation of our living and parenting." "Thank you so much for your important work with children and families. What a gift for me to be back at Gari's music class after all of these years with my children...so grateful to share this time with the little boy I nanny, you, and others..."
it's a morning wake-up yoga class for me....and it's been a really bonding and lovely time for (daughter) and me... it will live on with me, as she gets older, and I do. Hi Gari, I purchased your program 4 years ago and have used it as a guide and it has allowed be to add my own style and creativity! For example, I teach dance and use dance movements during certain songs. Gari you've done a great job putting this program together. Your creativity has made my classes very successful!! I would love to videotape a class for you so you can see how successful you really are! 30 minutes is the right amount of time and I like how you change it monthly, by keeping the beginning, middle and ending are the same, this enables the children to be familiar with their class but always have something new to look forward to learning. I really suggest this program to anyone doing baby classes or Mommy and Me classes. If you need additional info or thoughts about Gari's program, email me at TheSpiritofDance@amigo.net. Thanks so much Gari! "Gari. You are a real blessing to all who get to share your passion and gifts with you."